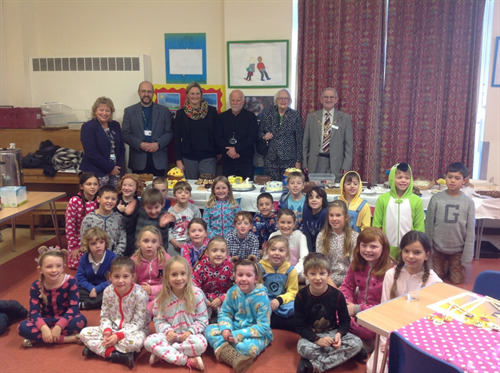 On Friday 15th November the Mayor and Mayoress of Seaford, Mark and Vera Brown, attended an event in which the children of Cradle Hill School took part in a “Bake Off “style competition to help raise money for Children in Need. There were 41 entrants to the cake competition which the Mayor and Mayoress were invited to judge along with members of school staff and governors. After the competition was over the cakes were sold and the best 6 were auctioned off to the highest bidders. The children and staff also donated £1 each or some cakes so they could dress up in pyjamas or onesies and the school has raised £629.92 so far. The Mayor and Mayoress stayed after the competitions to enjoy some tea and the lovely cakes made/donated with the parents/carers/staff and children.